Freemason symbolism in Rihanna’s music and videos? Last Wednesday and Thursday nights, over seven hundred Bajans gathered at the Sanctuary Empowerment Centre to pray and listen to a series of talks called Secrets of Freemasonry – opened by Tony Jordan, a well-known anti-Freemasonry crusader. A few years ago our old friends at Keltruth Blog ran an extensive series of critical articles looking at Freemasonry in Barbados, its origins, practices and Masonry’s influence in the Royal Barbados Police Force. I was surprised by some of what I read and came to the opinion that the Masons are a multi-layered hierarchy akin to a gentleman’s club at the entry levels, but with some strange and hidden goings on at the higher levels, and a history of leadership and influence in governments around the world. I once saw a piece on Masonic symbols and symbolism evident in the design and construction of Washington, DC and it really impressed me. I can’t remember if that particular article was at Keltruth blog, but I’m sure someone will find it and post it as a comment on this article. 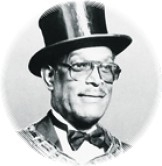 ‘Jordan also explained that most members in Barbados only rose to the position of master and were therefore unaware of the satanic elements of masonic lodges, whose stated tenets were brotherly love, relief and truth. Only those in the higher echelons of the lodges, from the 31st to 33rd degree, were aware that satanic worship was at the core of their rituals and that Lucifer was worshipped as the Great Architect of the Universe, he added. “They [masonic lodges] serve the same master: the Father of All Lights, Satan . . . . The rites seek to parallel much of what is in the Bible,” he told enthralled listeners. Was Black Freemason and Abolitionist Prince Hall born in Barbados? An upsurge in search queries from New York about murder victim Fred Parris made us curious about the famous free black leader and abolitionist, Prince Hall. Victim Fred Parris (photo left), the brother-in-law of Barbados Governor General Sir Clifford Husbands, was elected in 1995 as the 52nd Grand Master of the Prince Hall Masons of New York State. Mr. Parris was murdered Wednesday, December 8, 2010 while out for his morning walk and sea-bath at Brighton Beach. Police say that robbery was not the motive. Prince Hall: Escaped Barbados slave, Boston slave or born free? Comments Off on Was Black Freemason and Abolitionist Prince Hall born in Barbados?